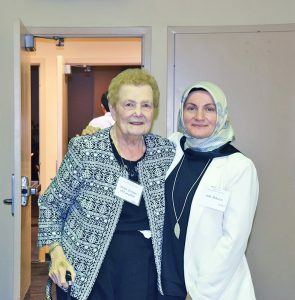 Sister Jeanne O’Laughlin, OP, left, with Asli Akkaya, faculty member of the Florida International University. October 24, 2016, Miami, Florida – Sister Jeanne O’Laughlin, OP, received the Community Service Award for her work with refugees during her years of service as President of Barry University, 1981 to 2004. The award was presented to Sister Jeanne during the Peace and Dialogue Dinner sponsored by the South Florida Branch of the Atlantic Institute on October 15 in the Kovens Conference Center at Florida International University. Headquartered in Atlanta, Georgia, the Atlantic Institute is an independent, non-profit organization focusing on facilitating dialogue in the Southeastern United States. The organization’s efforts are based on Hizmet, a social movement that seeks to create a more harmonious world through interfaith dialogue, education, and service. While the movement began in a Muslim nation, the Atlanta Institute is open to people of all faiths. The purpose of the Peace and Dialogue Awards is to “recognize influential persons who actively promote diversity and intercultural exchange in the workplace, the government, or other vocational spheres in their communities” as a way to encourage them to continue in their efforts. In an interview, Sister Jeanne said she had been approached about the award during the summer by members of the South Florida Branch, who were predominantly Muslim. “I don’t need another award, but I realized they need people to stand up and be vocal about the fact that there’s one God and we are all one people,” she said. Sister Jeanne recalled the beauty of the experience, which was shared by her family members and by Sister Peg Albert, OP, President of Siena Heights University, and Sister Therese Margaret Roberts, OP. During her tenure as President of Barry University, Sister Jeanne was involved in numerous community organizations and often worked on behalf of immigrants. She worked with the Immigration and Naturalization Service (INS) to ensure that children would not be locked in detention and to monitor 300 Haitian immigrants who had been in detention. Through her efforts, hundreds of immigrants were paroled to her. In addition, Sister Jeanne intervened in two highly publicized cases: that of three Chinese women who had sought asylum and were kept in a room at Miami International Airport and in the case of Elian Gonzalez, a refugee from Cuba who was in the middle of a custody battle between his father in Cuba and his relatives in Miami. « Dominican Sisters of Adrian: ‘80 People in Dominican Republic Served in Volunteer Dental Clinic’	» Siena Retreat Center: “Integral Ecology” – A Day of Reflection with Linda Gibler, O.P.